Beames on Film: Beames on Comics? Since moving to Barcelona at the end of 2014 I haven't updated this blog at all - as a result of settling in a new country, a lack of access to new film releases, and (mostly) apathy. Sad to say, but I haven't been keeping up with movies in 2015 and therefore there's been no real reason to continue this blog in its original form. However, thanks to the wonders of digital publishing, I am still able to buy new comics each Wednesday - something I've been doing now for about four years - and so I'm in a rather better position to write about those than I am about movies as things stand. Maybe that'll change but that's the reality right now. I've actually been thinking about writing comic book related articles and reviews for the best part of two years but I've allowed silly things to stop me up to this point. Laziness is certainly one of them ("I'll start blogging again next week") but mostly, stupid as it will sound, every time I've sat and the keyboard and felt like writing about a comic book I've been put off by the fact of having to actually think of a name for a new blog (Beames on Film was always intended as a placeholder to just get me started actually writing) added to the minor hassle of setting it up. So I've basically decided to cut the crap and just start writing again on this existing blog, which started last night when I posted a comic book review. For all I know it might be pointless: even a consistently popular monthly comic book has very low circulation in 2015, so comic books (despite their over representation in broader popular culture in recent years) remain an extremely niche bit of 'popular' entertainment. To put some figures on that, every month Batman sells around or just over 100,000 copies. And that's Batman - most comics sell far fewer copies than that. Admittedly this doesn't account for digital sales, which the industry doesn't publish, but the number of sales is likely still low even given our wildest estimations of what digital sales might be. Do digital sales double readership of Batman? Do they quadruple physical sales? Even then we are talking about a niche unit of entertainment, smaller than any TV show or movie or pop song or vaguely popular YouTube video you can think of. Compare that with the latest movie adaptation of the Fantastic Four which bombed last weekend at the American box office, earning around half of its already low projections following terrible reviews and general negativity surrounding the movie. By all accounts that film is a financial disaster and a big blow to its backer, 20th Century Fox. An embarrassment. I'm a massive nerd and I love the Fantastic Four and I have no interest in seeing it at all... that's how badly it's doing. But if that film has so far grossed around $65 million then - even allowing for insane ticket prices - at least three million people have seen it so far. Incidentally the comic book itself was cancelled earlier this year due to low sales (about 30,000 copies a month, globally). And that's not even accounting for the fact that popular culture and the mass media report on and engage in dialogue around even those movies people don't flock to see. So even a film that absolutely "fails" there's still a good chance the average person on the street has heard of it. So, to come back round to my point, it could be that talking about single issues of new comic book releases is so impossibly niche that nobody even reads this blog - which used to do ok numbers on movie reviews. Because even small movies are huge things. So I'm obviously not doing this for the hits. Why am I doing this? Basically it comes down to the fact that over the last few years I've really gotten into comics after years of being interested but having zero idea where to start, so for starters I'd like to review comics with an eye on new reader friendliness and accessibility, which isn't really an angle I've seen covered much. From what I've seen and experienced, conventional wisdom amongst comic book readers is that it's pretty easy to become a comic book reader: you go into a shop, pick up something you like the look of and buy it. And bang, you're buying comic books. But the reality is that comic books (at least the mainstream superhero kind) are intimidating to the uninitiated - and in some cases that can go for the stores they are sold in and the gatekeepers who work there as much as the books themselves. Honestly, I've read this comic and I'll be damned if I know, Cap. Let's stick with the books though. In terms of the big, mainstream superhero comics, many of the best known ones have been running in an ongoing, continuity intensive way for at least fifty years and in some case a good deal longer. Now I've heard the point made, and it's a good point, that audiences jump into ongoing stories all the time when they watch a soap opera or join a TV show half way through whilst flicking channels. This is true, but whilst your average episode of Eastenders might reference that somebody you've never heard of is having a baby, or has died or is going through a divorce, these are all fairly familiar scenarios. However, comic books are often full of strange concepts and governed by an internal logic which doesn't tally with everyday experience. I first started reading monthly, single issue comics in around 2011 and, for the first two years, I barely read anything without Wikipedia on hand. 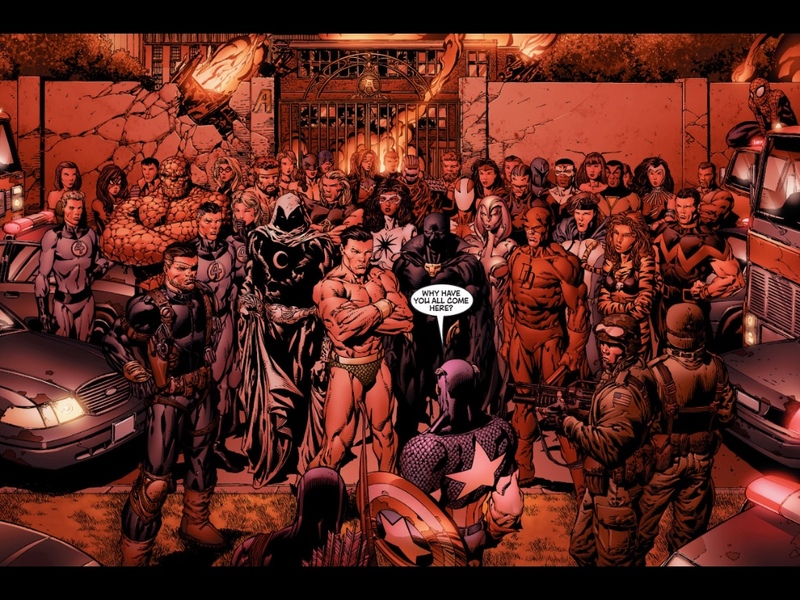 Understanding much of what was going on in, say, Avengers vs. X-Men required more work and research than I think a sane person would ordinarily invest in entertainment media. So there're complicated backstories and convoluted, decade-spanning plotlines to try and understand. Then there's the peculiar publishing model which means, without research, it's often difficult to look at a shelf and understand which books come in what order. Trying to piece together, for instance, the correct reading order for Ed Brubaker's (completely brilliant) run on Captain America can be a confusing process even for the initiated. 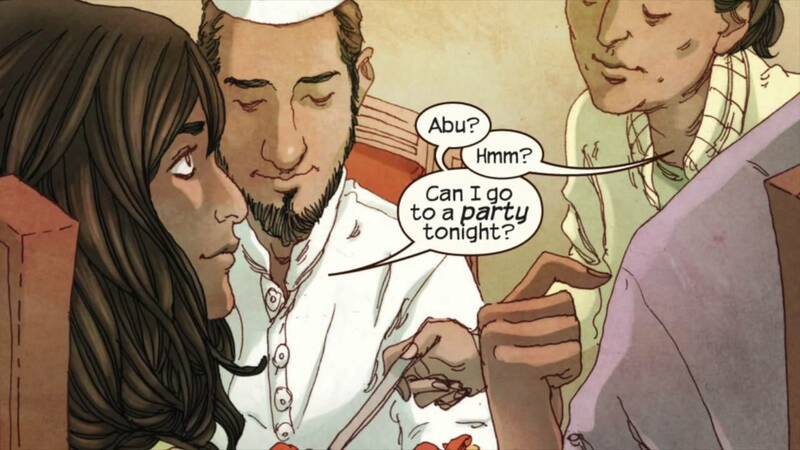 Kamala Kahn as Ms. Marvel is a great example of a step in the right direction. And it helps that the comic is also excellent. And this is all before we even come to the huge inclusivity/accessibility issue that is the ongoing question of representation, with the overwhelming majority of books written by (and largely for) straight, white men. Anyway, I've rambled on writing this post for a lot longer than I originally intended. Basically, I'm going to give this a go and see if it's fun writing about comic books for a while. If it goes well and people do seem interested then maybe I'll try and write for other people or start a dedicated blog. Maybe I'll talk about film now and then but, for the most part, I'm going to be talking about comics, likely with an emphasis on flagging up things that could serve as good jumping on points for new readers. Watch this space for reviews and features in the coming months. I hope they're of interest to somebody!